While most of Southcentral Alaska is preoccupied with hunting or berry picking during the last weeks of August, there is a different kind of harvest ripening in the Rainbow Room at the William Jack Hernandez Sport Fish Hatchery in Anchorage. The three-year-old rainbow trout captive brood stock are celebrating Christmas and New Year’s mid-way through their “winter” and beginning to show signs of maturation. It has been said “It is not nice to fool Mother Nature.” At the William Jack Hernandez Sport Fish Hatchery, the spawning of rainbow trout is a serious matter which uses control of environmental cues such as length of day and water temperature to induce spawning. By altering when the water warms, and the days lengthen, the Alaska Department of Fish and Game, Division of Sport Fish optimizes the hatchery process that ultimately provides the 650,000 fingerling and 300,000 catchable rainbow trout stocked throughout Alaska each year. So, when the colors of the leaves begin to change in the fall, the hatcheries’ rainbows internal clocks have been “tricked” to believe it is the middle of winter with spring spawning just ahead as their daylight begins to lengthen. The department’s rainbow trout captive brood program began in 1974 at the Fire Lake Hatchery located just north of Anchorage, then in 1978, transitioned to the Fort Richardson Hatchery, also located in Anchorage. During that time, rainbow trout eggs were collected from several locations throughout the state and brought back to the hatchery for incubation and rearing. Fish from the Swanson River on the Kenai Peninsula survived better in the hatchery, and when stocked in lakes. Today, the captive brood stock is descended from wild Swanson River rainbow trout collected in the 1980s. When the department operated the Fort Richardson hatchery, water used to rear fish could be warmed by using the waste heat from the Fort Richardson power plant. In the spring, hatchery staff members were able to increase the outdoor raceway water temperature earlier than the normal temperature regime of the Swanson River. Thereby advancing spawn timing from May to early April. The primary goal of advancing spawn timing involves stocked fingerling survival. At Fort Richardson, fry taken from eggs in April were grown to 2 grams and stocked out in September. However, this is a time when lake productivity is beginning to wane, which could have a direct impact on fry survival. Today, with advanced spawn timing, hatchery staff can now stock fry in June, when they weigh 3-4 grams as lakes reach the best growing conditions. Stocking rainbow trout fry just a few months earlier provides a better chance for survival to a catchable size. In the William Jack Hernandez Sport Fish Hatchery Rainbow Room all environmental factors are controlled to optimize fish health and spawn timing. Photoperiod is the primary cue. To induce spawning four-and-a-half months ahead of the natural daylight cycle, automated light controls are used throughout their life. 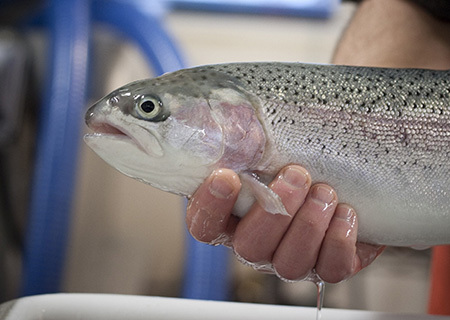 Of the five species reared at the hatchery, Chinook and coho salmon, Arctic grayling, Arctic char, and rainbow trout, only the rainbow trout have an altered light and temperature regime. While the advanced spawn timing caused by changing the seasonality of light and water temperature in the hatchery is most beneficial to attaining the fry stocking program’s size at release and timing goals, the hatchery’s catchable program also benefits by growing fish in cooler water which improves water quality and reduces stress related issues caused by rapid growth. Contrary to what might be thought, the winter months from November through February are some of the busiest at the hatchery. By advancing and accurately controlling the rainbow trout spawn timing, other fish culture activities in the hatchery can be scheduled and crew workloads balanced. The William Jack Hernandez Sport Fish Hatchery opened in June 2011. 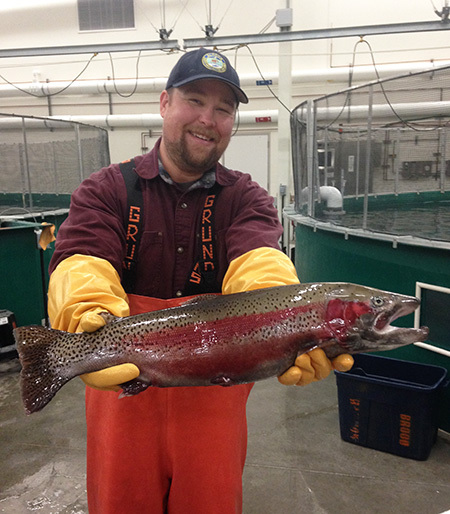 The first rainbow trout captive brood egg take occurred in late December 2013. Other years’ egg takes have been during the first weeks of January. In 2018, the photoperiod has been moved forward another 30 days to target an early December egg take. 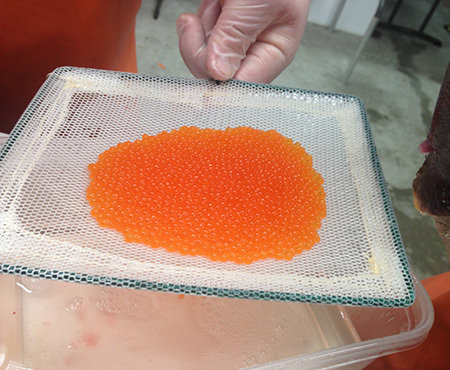 So, this winter as the hunters and gatherers of Southcentral Alaska are comfortably enjoying the bounty of their harvest while preparing for the holidays, the staff at the hatchery will be harvesting rainbow trout eggs with the goal of making your next fishing trip a successful one. Let’s just hope Mother Nature doesn’t mind a little well-timed assistance. Chuck Pratt is a Fish Culturist with 30 years of experience who works at the William Jack Hernandez Sport Fish Hatchery in Anchorage, Alaska where he oversees the rainbow trout and Arctic char captive brood programs.